As well as presenting for your gaming pleasure all of the below 24 titles, extras have been included, in the form of video interviews with some of the original developers of the games. These are fascinating - it's quite interesting to hear Eugene Jarvis talking about "Robotron 2084", for example. It's unfortunate that the video and sound quality isn't as good as you'd hope, but they're certainly watchable, and a welcome addition. Other extra features include scans of arcade flyers and further text details you can read via the interface. Are there problems with these games? While they all certainly look like they're close to if not exactly arcade perfect conversions, some of these games have issues with control. This is to be expected, since a number of the games used specific styles of controls in the arcade (eg a trackball for Marble Madness or the steering wheel for Spy Hunter) that are now mapped to a standard controller. If you've never played a game before, you'll never notice the difference, though, as the controls certainly aren't badly done, just different to what you might have been used to in the arcade. Attention collectors! 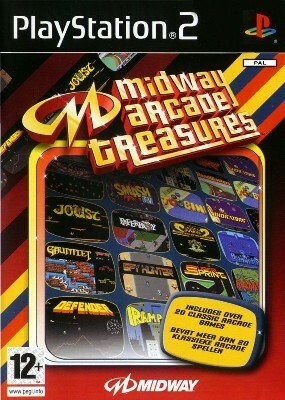 There's a cover variation, as the title was originally released as just "Midway Arcade Treasures", but then was reissued with the front cover redesigned to match that of MAT 2 and MAT 3. SA vertically scrolling driving shooter - you're out there to clean up the roads with your machine gun and whatever extra weapons you can pick up along the way - oil slicks, clouds of smoke, etc - but watch out for the car with the spinning wheel blades. The unforgettable Peter Gunn theme will help bring back all your great memories of the game the second you start it up. Horizontally scrolling shooters where you must defend the humans on the planet's surface from the marauding aliens. Both Defender and Stargate (Defender 2's other name) require twitch reflexes and strong instincts to really succeed - great times, but you'll need to use The Force to get those really high scores. The classic top view dungeon crawler game. Surely you've heard of it? Green elf.. is about to die. Wizard shot the food. A couple of flap-tastic dueling games - you have to constantly hit the button to keep your mount flapping its wings, and to win a joust with an enemy, be at their height or higher - turn your foes into eggs and collect the eggs for points. A week of paper deliveries stands between you and success. Can you make your way through the isometric 3D neighbourhood delivering papers to the right houses and avoiding the passing cars, barking dogs and out of control lawn mowers? A three player simultaneous classic from the arcades - as one of three monsters, you have to travel from town to town destroying all the buildings and stomping, bashing or destroying as much of the army trying to kill you as you can. Watch out for bonus items hidden in the buildings, and chow down on the puny humans for energy. This game will definitely challenge your dexterity - a 3D isometric maze where you have a tight time limit to roll a marble from one end of a maze to the other, without smashing it, rolling it off the side of the maze, or getting it attacked by one of the various beasties out to get you. An all time classic created by Eugene Jarvis of Defender fame - one joystick for movement, one joystick for the direction you're firing. Save the nuclear family from wave after wave of evil robots out to destroy humanity. Get good enough at this game, and you could reach nirvana.. it's definitely a Zen thing. A more modern update of the Robotron 2084 game set around the theme of a killer game show. Improvements include amusing boss fights and various useful powerups, not to mention hilarious speech from the emcee. Big money! Big prizes! I love it! A cute game set in a sink where you have to collect bubbles and avoid the spider. They had imaginations back in the day, yes they did. Drive through the wasteland shooting your enemies, collecting fuel and desperately fighting your way from one checkpoint to the next. A classic from the Atari Games stable. A fun game with elements of Tetris and the old Atari game Warlords - each player takes turns building their castle, defending it and attacking their enemies. Definitely more fun with more than one human player. An underrated classic - probably because of its high difficulty level. You have to fly around in your spaceship mining asteroids for Sinibombs and avoiding the warrior and worker drones before the Sinistar is completed - when he is, watch out … try and bomb him before he eats you. A great game that'll take practice to get good at, and with some entertaining speech. Run, coward! The grandfather of all the various Tony Hawk's games, 720 involves you skating around town doing as many tricks as possible to earn points to get into various skate parks to win prize money, allowing you to build your character up and avoid the killer bees that chase you if you're too long about things. A fun game with a great soundtrack. A top view single screen racing game with up to four players, and various tracks to chase each other around. Collect the golden spanners to power up your car between races. An interesting concept for a vertical scroller - you're river rafting in an inner tube, and have to avoid various obstacles and throw empty pop cans at various targets. A fun puzzler - various coloured tiles come scrolling down at you, and you have to stack them in various orders to create Klaxes, which give you varying amounts of points. Easy to get into, and challenging to get higher scores, although perhaps not as universally appealing as Tetris. A very limited release game that works on similar hardware to Robotron or Joust, and designed by John Newcomer (who designed Joust). It's a kind of food fight version of Robotron - catch the falling food and use it to throw at other characters in the game. Despite the rather cool name, this is a relatively simple shooter reminiscent of Phoenix or Galaxian.. one wrinkle is that you have a very limited shield you can use to avoid being dive bombed or shot. A top view tank game - invade one enemy territory after another, destroying bunkers and enemy tanks. Entertaining enough, but certainly nothing special. You play a soda jerk who has to work his way up and down various bars throwing cold mugs of root beer at people before they slide all the way up to your end of the bar. You also have to catch all the empty mugs that are thrown back at you. A very fun game that gets frantic fast. Trivia time: The original arcade game was initially called just "Tapper", and had advertising for Budweiser in it - but the game was later modified to change the player from a bartender to a soda jerk, hence "Root Beer Tapper". Perhaps advertising beer to children in arcades wasn't such a brilliant idea?